On Thursday, October 4, Father Dominic Pham celebrated Mass at St. Patrick. Students, family, and staff gathered to participate in the school-wide mass. Father Pham is from Sacred Heart Parish in D’Iberville, and Thursday was the Feast Day of St. Francis of Assisi. A relic from St. Francis of Assisi was displayed at Mass. At the end of Mass, Father Pham walked around with the relic and asked for his blessings. Father Pham gave a wonderful homily about God and his love for us. He talked about how beautiful our love for God is. Father Pham also told stories to the students to help them know how much God loves us. Father Pham is always happy to see the students and share God’s love with them. All of the students love when Father Pham celebrates mass at St. Patrick. The Campus Ministry Team helps set up Mass every week. The wonderful choir and Ms. Darlene Previto provided music for the Mass. Senior Christina Parry altar served for the Mass on Thursday. Several juniors read the readings and brought up the gifts at mass. Family and friends are invited to participate in Mass at St. Patrick every Thursday at 9:40 a.m. Adoration will be held this Thursday at 9:40. Mass at St. Patrick is a great opportunity for students to gather together as a family. Mass connects all of the students and brings them closer to God. 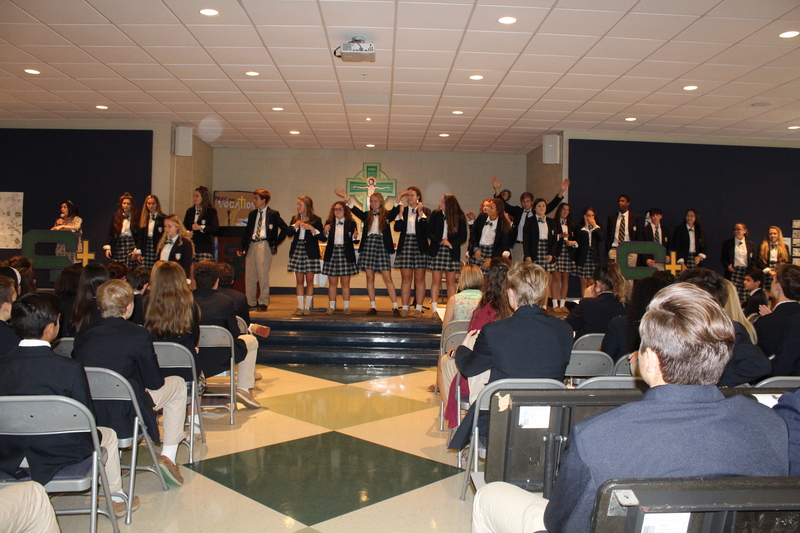 Throughout the day, Mass challenges students to think about the homily and how they are spreading God’s word. Photos from the Mass can be found here.